Artristic expression runs strong within the people of Tofino and Clayoquot Sound. The Nuu-chah-nulth people, the first nation of this area, are very active as artists. Carving and weaving has always been a part of their lives. Art was integral to ceremonial displays, whaling canoes, clothing and nearly every aspect of their days. In recent history, the 60s, a new style of artist expression entered the area with the arrival of the hippies. Looking for a new lifestyle they left the city and created communities on outer beaches of the area. A free and expressive flair came out of those times that can still be seen within the works of local artists today. Within the fishing and industrial community folk art forms on their own developed utilizing nautical themes and rustic west coast looks. 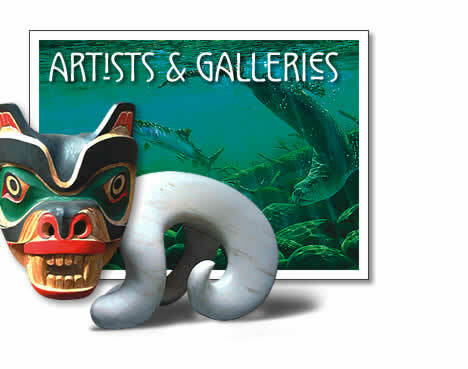 There are many fine art galleries in Tofino, showcasing a broad range of the areas wares. Tofino artists and Tofino art galleries: There are many fine galleries in Tofino, showcasing a broad range of the area's artists.